Tourist Information Guide for Moreton-in-Marsh in Gloucestershire in the Cotswolds. Links to accommodation in the local hotels, places for eating out, pubs and restaurants, the history, transport links, what is on and things to do, estate and letting agents, health, sport and leisure facilities. Moreton-in-Marsh is situated the head of the Evenlode valley on the Fosse Way. It is a pretty town of the honey-coloured stone quarried from the local area. The broad High Street has the Fosse Way, a major Roman road from the south coast to Lincoln lying beneath the modern surface. Moreton-in-Marsh was also well placed for the old coaching route from London to Worcester and the town became a popular stopping place for stagecoaches, hence several coaching inns that still exist in the thriving market town, which was given its Saxon Charter over 1000 years ago when it was part of the region known as Mercia. The Four Shires Stone about two miles out of the town was the meeting place of four regions, Gloucestershire, Warwickshire, Worcestershire and Oxfordshire. 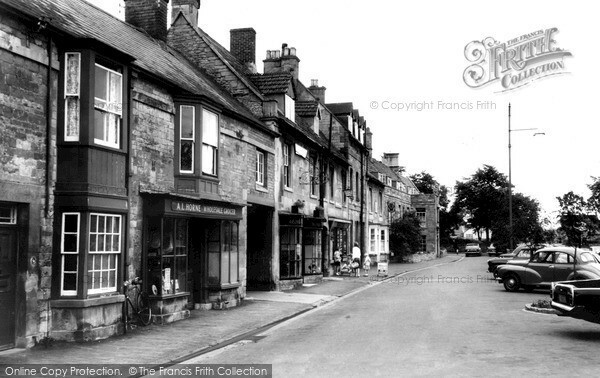 Moreton-in-Marsh was granted a market charter in 1227 and the weekly market still takes place each Tuesday. 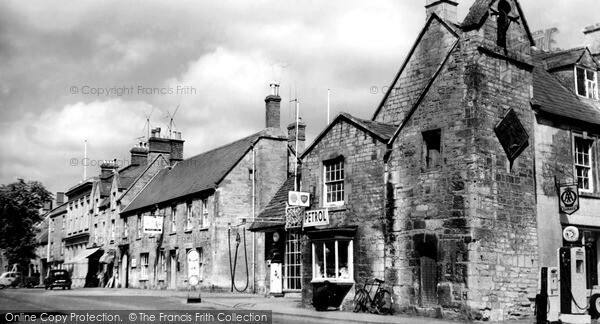 Like many of the towns and villages in the Cotswolds wool and cloth making was the source of income during the medieval years thus many of the buildings along the main street date back to the 17th and 18th centuries. Several of architectural interest include The White Hart Royal where King Charles I is reputed to have stayed there during the English Civil War, the Market Hall built by the Redesdales from nearby Batsford House, the Curfew tower on the junction of High Street and Oxford Street and St David’s Church. The modern township has a good selection of small independent shops with no famous brand names here, teashops, restaurants, antiques and art galleries all stretch along the towns High Street and in the small shopping mall. The Wellington Aviation and Art Museum is a haven for enthusiasts of World War II memorabilia including paintings, prints, models and aircraft history, with the proceeds going to the RAF Benevolent Fund. The museum records the history of RAF Moreton-in-Marsh; a flight training station for RAF Bomber Command during the Second World War and over recent years has become the Gloucestershire Fire Brigades training headquarters. The town is situated at the junction of the A429 and A44. There is free on street parking available around the town but it can be difficult to find a space alternatively there is a pay and display car park available in Station Road. 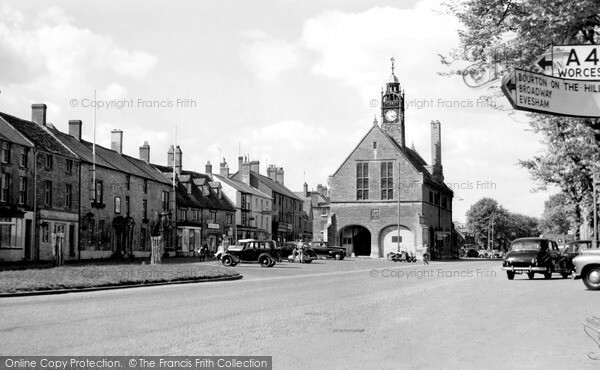 More old photographs of Moreton-in-Marsh can be seen at the here. Moreton-in-Marsh has a number of hotels in or around the local area suitable for short breaks or bed and breakfast. The town is an ideal base for the North Cotswolds, within 10-20 minutes of places such as Stow-on-the-Wold, Stratford-upon-Avon, Bourton-on-the-Water and Broadway. The Redesdale Arms Hotel is a lovely 18th century coaching house, a haven for anyone looking for traditional delights, fused with the quality of comfort in the centre of the town. The White Hart Royal is a wonderful example of a typical 17th century English coaching inn with many features such as old stone walls and mellow beam work. The restaurant and bar offer a fine selection of freshly prepared meals from an extensive menu together with a wide range of traditional beers and fine wines. Standing proudly on the High street is the beautiful 18th century Bell Inn a former coach house hewn from the local golden coloured Cotswold stone. The Manor House Classic is a Country House style hotel located in the heart of the town in with excellent food served at the Mulberry Restaurant. Close to the town is the beautiful village of Blockley where a warm welcome awaits visitors at the Lower Brook House , a 17th Century oasis of peace and tranquility, making this the perfect getaway location, and a marvelous base from which you can enjoy everything that England's largest area of outstanding natural beauty has to offer. Also in Blockley is The Crown Inn , a warm 16th century inn and hotel which offers its visitors the best in Cotswold hospitality. Real ales, fine wines, superb food and a warm welcome await you from your hosts Sarah and Lisa at The Red Lion , just eight miles from Moreton-in-Marsh. The hotel at Long Compton has a newly refurbished interior but retains an old world charm with log fires, stone walls and oak beams. We produce high quality gluten free ready meals frozen for your convenience. Also delicious sponge cakes, apple pies & quiches. Christmas cake orders now being taken. We also offer a good selection of gluten free and vegetarian dishes in our licensed tea room/restaurant. Open 7 days a week from 08.30 including Sundays for Sunday lunch. From December 1st we will be offering a special Christmas Menu from £7.45. Why not make up a party of 6 or more and get a 10% discount. For order forms or more information telephone the above number or pop in and see us.